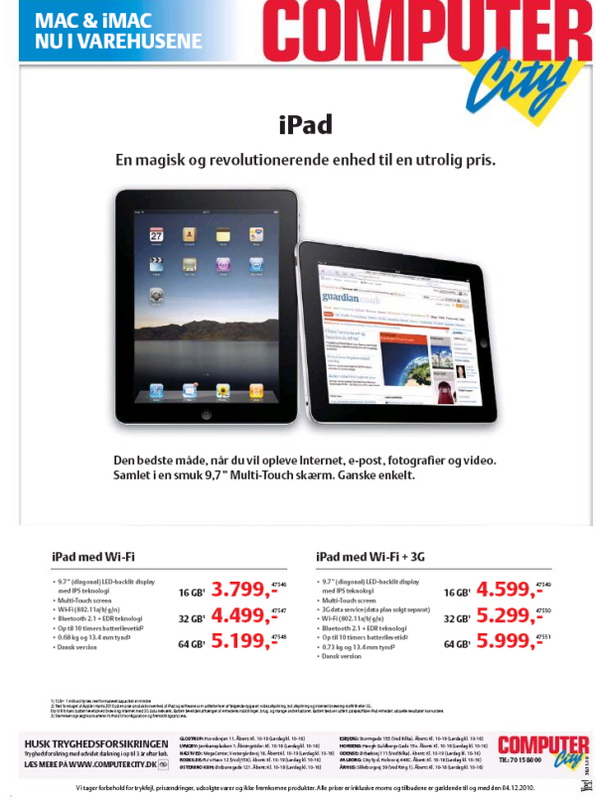 Numerous media outlets are reporting that Scandinavian countries will be seeing an official launch of the iPad tomorrow. Apple representatives in several of the countries including Norway, Sweden, and Denmark have confirmed the reports. Pricing from at least one retailer can be seen in the ad above. Reports claim all other Scandinavian countries including Finland and Iceland are also getting the device through third-party retailers tomorrow. Retailers reported to be carrying iPads at launch include Computer City, ElGiganten, Humac, and Eblehuset. Carriers in the region will reportedly not be selling the device itself. However, those already reported to be offering 3G data plans for their respective regions include Tre, AB, Telenor ASA, TeliaSonera, and Tele2 AB. Previous Entry: Microsoft to start online cable TV subscriptions on Xbox 360?